Candidates traded insults, yelling, screaming, interrupting and mean talk at the latest Republican Party debate. The debate, on Thursday evening in Detroit, was filled with yelling and personal insults. Party front-runner Donald Trump debated with Senators Ted Cruz and Marco Rubio, and Ohio Governor John Kasich. The candidates questioned the other candidates' manhood. Trump called Rubio, "little Marco." Rubio earlier in the week said Trump had small hands. New York businessman Trump called Cruz "lying Ted." Rubio looked at Trump and told him he mocks everybody. Trump returned an insult by calling Rubio, a "lightweight" and "a real con artist." Cruz and Rubio took the verbal fight to Trump. Cruz accused Trump of being "someone who has used government power for private gain." Rubio said Trump is "trying to con people into giving him their vote." Cruz belittled Trump, saying: "I think that the American people understand that yelling and cursing at people doesn't make you a tough guy." Kasich was low-key and stayed out of the verbal fight. He is trailing by a large margin in the polls. "I have never tried to go and get into these kinds of scrums that we are seeing here," Kasich said. "People say, wherever I go, ‘You seem to be the adult on stage.' "
The new world was filled with wonders. Ordinary people abuse Congressmen and President with shockingly personal insults. This week a poll showed him in a dead heat with Mitt Romney, the Republican front-runner. He's very conceited but he's just a lightweight in politics. 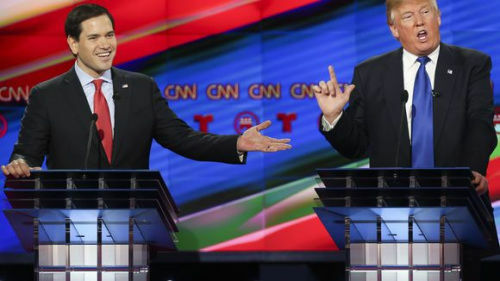 1.Cruz and Rubio took the verbal fight to Trump. Cruz accused Trump of being "someone who has used government power for private gain." Many voters think that the system has been used for private gain, not public good. Corruption is the use of governmental powers by government officials for illegitimate private gain. 2.Kasich was low-key and stayed out of the verbal fight. He is trailing by a large margin in the polls. I had just as soon he stayed out of the quarrel. He tactfully stayed out of all but the most desultory conversations with the members.